The Kiwi Social Share plugin will provide a simple, but complete integration between your site and the most popular social media channels. The free version will provide an integration with Facebook, Twitter, Google+, Pinterest and LinkedIn. You can upgrade the plugin to the Pro version and also gain the following channels: Reddit, Email, Telegram, WhatsApp, Skype. 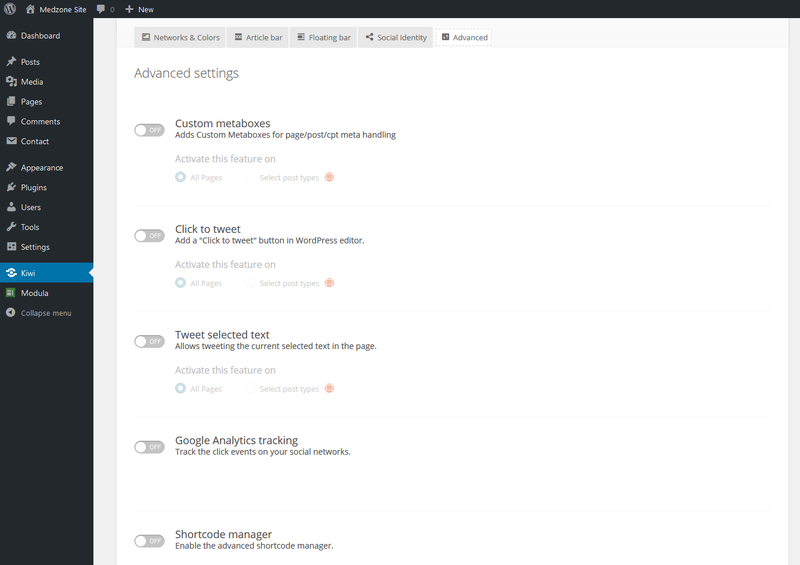 Installing the plugin will add a new tab to your admin panel : Kiwi. There are 5 configuration tabs available. 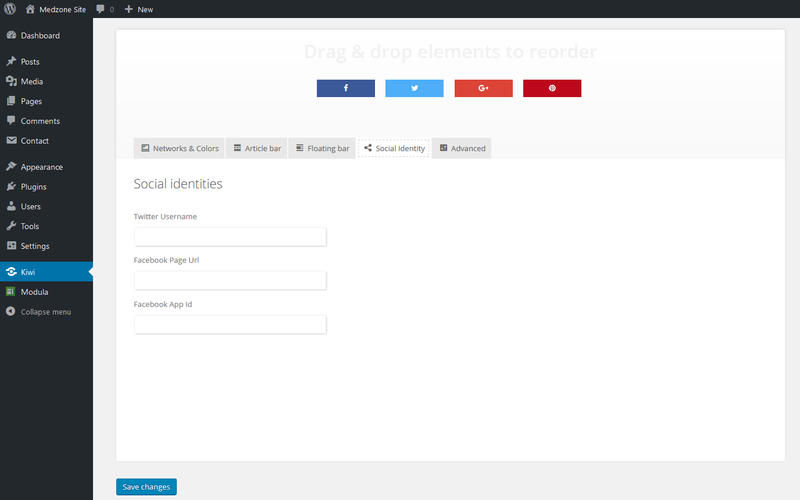 This tab will allow you to select the social media channels you want to use in your site. 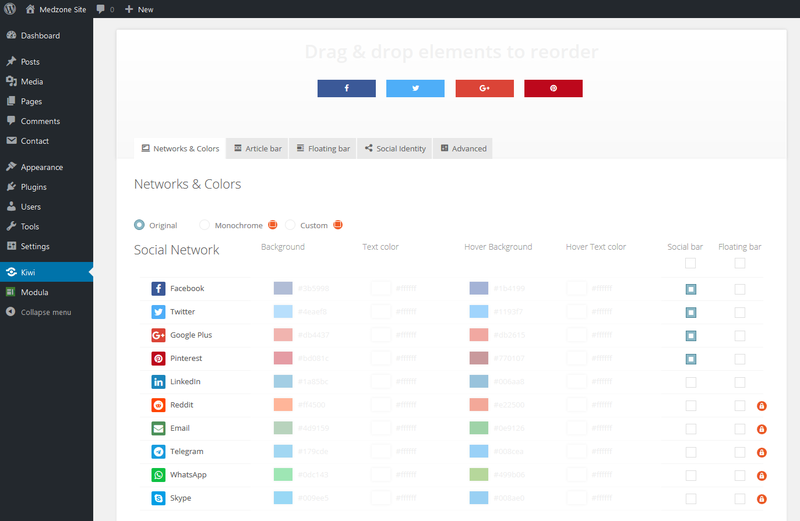 The free version offers only the original color scheme, while the Pro version will allow two extra color schemes: Monochrome and Custom. This will provide several configuration options regarding the position of the social media bar (before or after content), the button shapes and how the button groups are displayed. The last setting allows you to display the share count as well. You can change the type of the social bar to a floating bar displayed at the edges of your screen. Here you can set the Twitter username, Facebook page URL and the Facebook App ID. In this tab you can enable custom metaboxes, add the click to tweet button in the Wordpress editor, enable the tweet selected text and google analytics tracking. The last options are the enabling of the advanced shortcode manager and controlling the whatsapp icon.